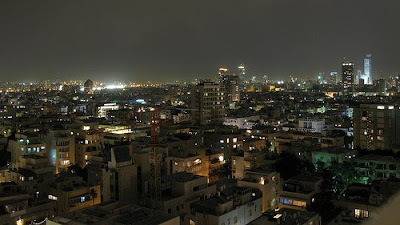 The city of Tel Aviv joined the “Earth Hour” project today with a one hour ‘lights off’ between 8:00-9:00 pm. The municipal building and towers around the city coordinated a live TV broadcasted ‘lights off’ which has definitely left an impression. At first I adopted a very cynical attitude towards this initiative (which was even sponsored by corporations branding themselves ‘green’ but in reality have a long way to go). However, I quickly changed my mind as I witnessed the effect it had on awareness. Rationally speaking one hour of darkness has no real affect what so ever. Furthermore, it may also be used as a distraction from the real environmental issues at hand which require an attention span of more than one hour and a lot more money. Marketing, however, is a whole different story. Going green has definitely become a major trend. Trends have their life spans. The green trend will soon finish its hype phase and will hopefully lead to the next step which is usually comprised of hundreds of various companies and researchers making it more economically feasible. Future studies or futurology, according to Wikipedia, is “the practice and art of postulating possible, probable, and preferable futures. Futures studies seek to understand what is likely to continue, what is likely to change, and what is novel. Part of the discipline thus seeks a systematic and pattern-based understanding of past and present, and to determine the likelihood of future events and trends. 3. Companies and researchers developing new, improved applications which introduce the technology back to the market stronger and better (takes approx. 20 years). Green tech has many forms: Geo-thermal, solar, hydro and more. One of the greatest shortfalls of green techs is the lack of a strong economic incentive. Hopefully, by the time the hype dies down, and oil prices continue rising, more economically feasible technologies will find their way to the markets. In the mean time, we have the responsibility to continue educating the next generation even if it’s just turning off the lights for one hour. Peak Oil – How close are we? How much are you willing to spend on lifestyle and image?